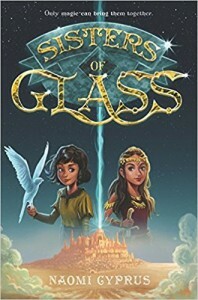 This powerful fantasy children’s book brings two young girls from two ‘realms’ in contact with each other, as they struggle to make sense of the worlds around them. The intense drama at times made me want to stop reading, as I’m a bit of a whimp. It just has some pretty dark and dastardly characters. Yet the plot theme is quite clever– two realms which are mirror images of each other, and people who also have mirrored counterparts. The story also involves two young girls coming to grips with the best and worst of their fathers, and that is not an easy subject either. Most of the children’s book revolves around the use of magical powers, which is what makes this first and foremost a fantasy book. It also seems to be set in some indefinable time period, neither past nor future. And an indefinable world as well. But it’s not so out there that we can’t relate to it and superimpose our own world. To me it is more graspable than most fantasy books that create an entirely different world operating under its own rules.